Other elements are also at play: The election yesterday of Sen. Trent Lott to the number two GOP leadership position in the Senate is also a threat to the White House and Rove, who worked against him when he battled to save his majority leader’s job after his insensitive remarks about Sen. Strom Thurmond. And insiders report that Bush counsel Harriet Miers isn’t a fan, believing that Rove didn’t do enough to help her failed Supreme Court nomination among conservatives. In fact, one top West Wing advisor said that the unexpected ouster of Rove aide Susan Ralston over ethics questions was orchestrated by Miers as a signal to Rove to leave. The advisor said that Rove is aware of the situation and that a departure might come in “weeks, not months.” A Rove ally, however, noted that he has a record of out-witting his critics. (Hat tip to Think Progress). With their vast intergalactic knowledge and ability to harness the Force, the task of convincing UN officials to recognise their cause should be a walkover for a pair of Jedi Knights. But self-proclaimed Jedis Umada and Yunyun, better known as John Wilkinson and Charlotte Law, have adopted a more conventional approach in their pursuit of recognition – delivering a protest letter. Umada and Yunyun said: ‘For the last ten years the United Nations has marked the International Day of Tolerance. While we support this important work, we feel the UN needs to move with the times. ‘Like the UN, the Jedi Knights are peacekeepers and we feel we have the basic right to express our religion through wearing our robes, and to be recognised by the national and international community. ‘We therefore are calling upon the United Nations Association to change November 16 to the UN Interstellar Day of Tolerance, to reflect the religious make-up of our twenty-first century civilisation. In the 2001 UK Census 390,000 people listed their religion as Jedi Knight making it the fourth biggest belief in the country. 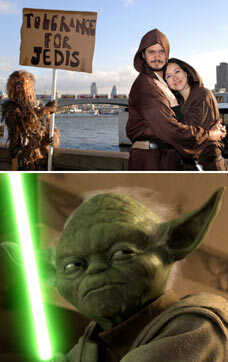 There are also an estimated 70,000 Jedi knights in Australia, 53,000 in New Zealand and 20,000 in Canada. If they aren’t successful with the United Nations, there’s always the Federation Council and Star Fleet Command. May the Force Be With You. Live Long and Prosper. Hail Eris! All Hail Discordia! The excitement of this week as number two ranked Michigan is preparing to face arch rival and top ranked Ohio State has turned into a day of sadness as legendary Michigan coach Bo Schembechler collapsed and died today during the taping of his television show. Schembechler became head football coach at the University of Michigan in 1969. That year he faced Ohio State when they were also ranked number one and billed as the team of the century. Bo upset his old mentor Woody Hayes 24-12, ushering in the greatest era of the Michigan-Ohio State rivalry. Schembechler had his first heart attack on the eve of the 1970 Rose Bowl, and another in 1987. Schembechler was also hospitalized in October of this year when he collapsed during the taping of his show. 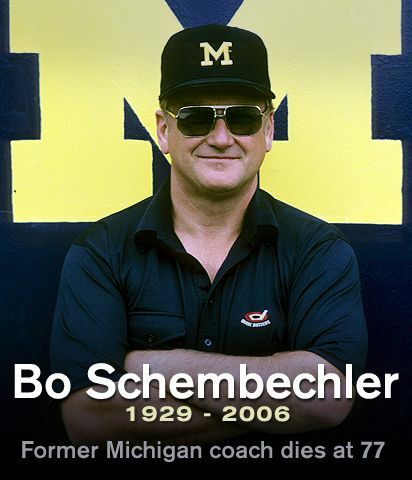 Schembechler had a 194-48-5 record at Michigan from 1969-89. His lifetime record was 234-64-8. At this point, it seems almost beside the point to say this: The New Republic deeply regrets its early support for this war. The past three years have complicated our idealism and reminded us of the limits of American power and our own wisdom. But, as we pore over the lessons of this misadventure, we do not conclude that our past misjudgments warrant a rush into the cold arms of “realism.” Realism, yes; but not “realism.” American power may not be capable of transforming ancient cultures or deep hatreds, but that fact does not absolve us of the duty to conduct a foreign policy that takes its moral obligations seriously. As we attempt to undo the damage from a war that we never should have started, our moral obligations will not vanish, and neither will our strategic needs. Rob Lowe, whose character Sam Seaborn worked behind the scenes, now gets a chance to play the candidate himself (beyond his brief run for Congress before leaving The West Wing.) Lowe is joining the cast of Brothers and Sisters “as Sen. Robert McCallister, a California Republican with one eye focused on the White House and the other on Kitty Walker (Calista Flockhart).” Coincidentally, Bobby McCallister was also the name of the boy fated to become Republican President in 2041 on the 2004 WB show Jack & Bobby. Contemporary politics was significant in Sunday’s episode of Brothers and Sisters as one of Kitty Walker’s brothers received a notice that he was to be sent back to Iraq. The episode included flash backs to September 11, 2001 to show why he initially enlisted. In Oliver Cromwell’s eloquent words, “I beseech you, in the bowels of Christ, think it possible you may be mistaken” about the course you and President Bush urge us to adopt to fight drugs. The path you propose of more police, more jails, use of the military in foreign countries, harsh penalties for drug users, and a whole panoply of repressive measures can only make a bad situation worse. The drug war cannot be won by those tactics without undermining the human liberty and individual freedom that you and I cherish. I append excerpts from a column that I wrote in 1972 on “Prohibition and Drugs.” The major problem then was heroin from Marseilles; today, it is cocaine from Latin America. Today, also, the problem is far more serious than it was 17 years ago: more addicts, more innocent victims; more drug pushers, more law enforcement officials; more money spent to enforce prohibition, more money spent to circumvent prohibition.